I love a good pot of soup. Chop some veggies, throw them in a pot, and you've got a delicious and healthy meal with plenty of leftovers so that you don't have to cook for another day or two. 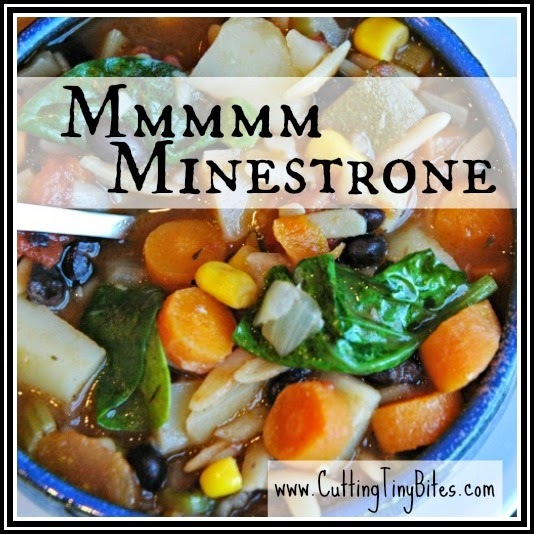 This particular pot of minestrone came out too good to keep the recipe to myself. If you like a little meat with your meal, some shredded chicken would be a delicious addition. Prep all your veggies. In a large soup pot, saute the carrots, onion, celery, and garlic in olive oil over medium heat. Cook until onions are soft, about 5 minutes. Add potatoes, zucchini, tomatoes, italian seasoning, and vegetable broth. Bring to a boil. Cover and let simmer until potatoes are soft, about 25 minutes. Add beans, corn, peas, and pasta. * Continue to simmer until pasta is soft, adding spinach when there are 2-3 minutes remaining. Add salt and pepper to taste. *Using this method, your pasta will continue to soak up liquid as it is stored as leftovers in your fridge, and may lose some of its bite. If you'd like to avoid this, cook your pasta separately, and just add a small amount of cooked pasta to your soup immediately before serving. Minestrone soup full of vegetables. Add a hearty loaf of bread for a healthy vegetarian weeknight supper.